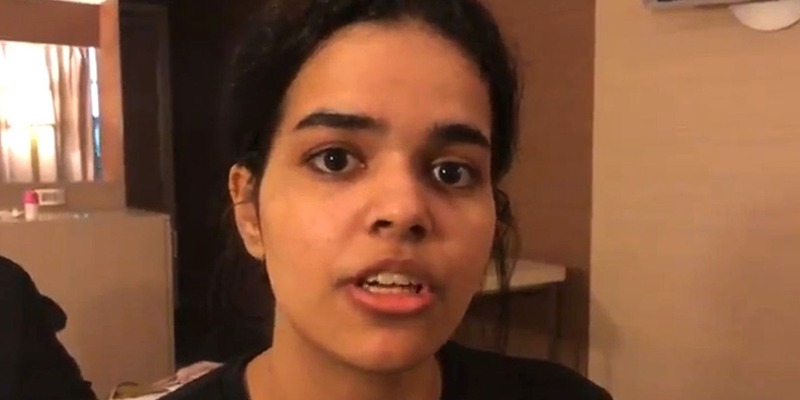 Rahaf Mohammed al-Qunun, the young Saudi woman who caught the attention of the world after fleeing her family in Thailand, arrived Saturday morning at the Toronto airport, where she was greeted by Canadian Foreign Minister Chrystia Freeland. "She has made a very long trip, she is exhausted and prefers not to answer questions for the moment," said the minister, in front of the many journalists who came to wait for the 18-year-old woman. The Saudi woman says she wants to flee the psychological and physical abuse of her family and was granted asylum by the government of Canadian Prime Minister Justin Trudeau. She had barricaded herself in her hotel room. The young woman's arrival in Canada marks the epilogue of a case that has attracted the world's attention for a week, after the young woman made her situation public by creating a Twitter account. She had been arrested when she arrived in Bangkok from Kuwait, where she had arrived with her family before giving them up. Thailand initially intended to return her to her country at the request of the Saudi authorities. But the young woman had barricaded herself in a hotel room at the airport, posting on Twitter a multitude of messages and videos desperate, and immediately achieving international notoriety. She also told Human Rights Watch that she wanted to renounce Islam, which puts her "in serious danger," the NGO said. Following a mobilization in her favor on social networks, the Thai authorities, who frequently push back at the border, had given up sending her back against her will and had allowed her to leave the airport with representatives of the United Nations. Office of the United Nations High Commissioner for Refugees (UNHCR). Sharp tensions between Canada and Saudi Arabia. Canada's decision may heighten tensions between Ryad and Ottawa. Saudi Arabia announced in August the expulsion of the Canadian ambassador, recalled his and froze any new trade or investment with Canada, after the denunciation by Ottawa of the arrest of Saudi human rights activists, including Samar Badaoui, sister of imprisoned blogger Raef Badaoui, whose wife and three children live in Quebec. Saudi Arabia is one of the most restrictive countries in the world for women's rights. In particular, they are subject to the guardianship of a man (father, husband or other) who exercises arbitrary authority over them and takes important decisions in their place. The Qunun affair took on a particular dimension after the murder in early October of journalist Jamal Khashoggi at the Saudi consulate in Istanbul, Turkey.